If you rather send me your pair of kicks and just pay for the artwork then click here >> and after payment you will be emailed shipping details. I wouldn’t be a Chef if I didn’t offer items on my menu to satisfy all tastes. While this doesn’t mean I customize every shoe into a ParaNorman theme, it does mean that I will offer a multi-course meal using the hottest kicks out as the key ingredient. 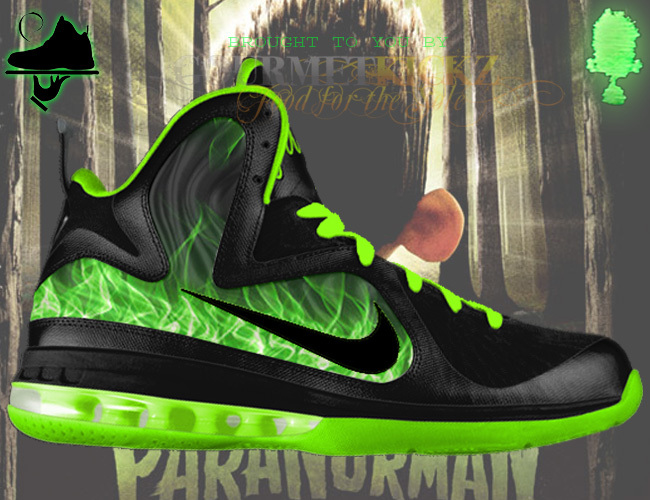 Above you see my take on how a ParaNorman LeBron 9 Foamposite should look. As you know by now bringing this dish to life is a easy task for me. Key features include glow in the dark zombie mist on the quarters, electric green accents, an electric green sole that glows in the dark, and plenty of other glowing accents. The packaging will be very similar to my King of the Galaxy LeBron 9 Foamposite package in that a custom box, custom insoles, and custom hang tag will be included. Check out more images after the jump and book your pair now. 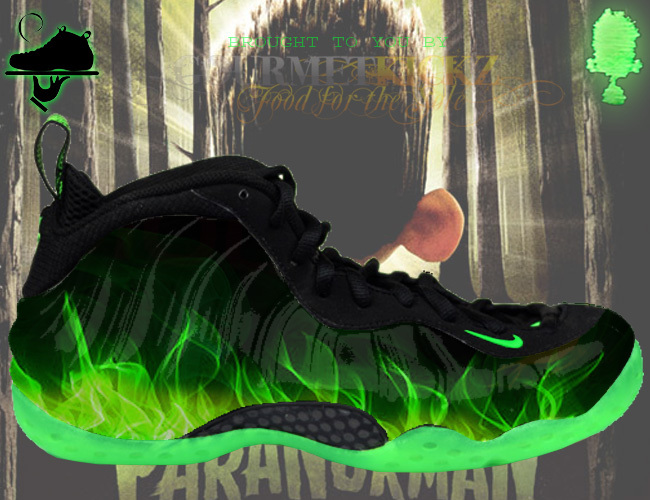 In an effort to offer those who are not chosen for the WeirdWins contest, I decided to launch my own customized version of the ParaNorman Foamposite One. This custom will use the House of Hoops Black / Neo Lime for a base and will feature a “zombie mist” graphic closely resembling the design from the original Nike limited release. 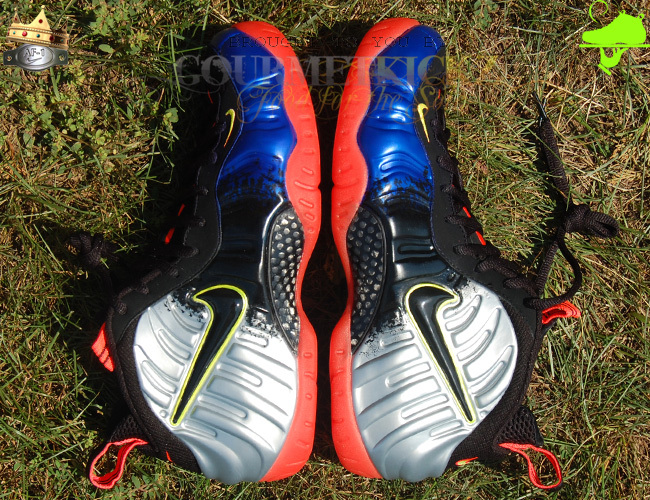 The soles of this custom will glow, similar to my other custom foamposites with glow in the dark soles. Unlike the Nike release version, the “zombie mist” print on my customized pair will glow in the dark, similar to how the uppers of my “Luminous Galaxy” foamposites glow in the dark. This ParaNormalike custom package will include a custom box, custom insoles, custom hang tags, and other details. Book your order after the jump or check out more kicks from my ParaNormania series. Since Nike has decided to let the “What The LeBron 9” remain on the design table as a scrapped sample, I decided to allow my clients the chance to customize their own LeBron 9 “What The LeBron”. What you see above is just a mockup of what the actual sample might look light. Very similar except for the solid white midsole and laces. Clearly I had to guess at the rear of the shoe too, but I think you get the point. 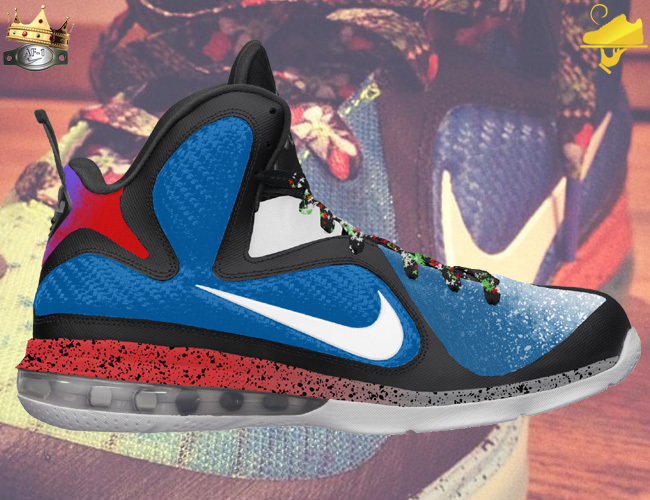 Now how about your turn to create your own “What The LeBron” composed of your favorite LeBron 9s? Commission me for this job by purchasing here or after the jump and we will engage in an intense design session where we work together to select the best base shoe and overall design for the left and right shoes. After we discuss the design, I will create a mockup rendering for the pair and upon your approval begin designing. You can even choose to send in your own kicks to save a little money. I look forward to creating some crazy customs, so lets get to cooking! The shoe will only be available until the NikeID LeBron 9 Foamposite is removed from their site. This shoe will take about 6 to 10 weeks to ship from the date of order, largely depending on how long it takes NikeID to ship me the base shoe. 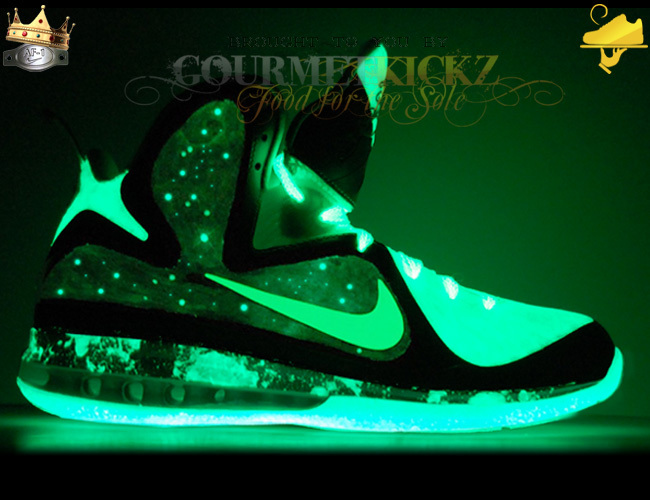 Owners of the first King of the Galaxy customs should contact me if they are interested in this pair. 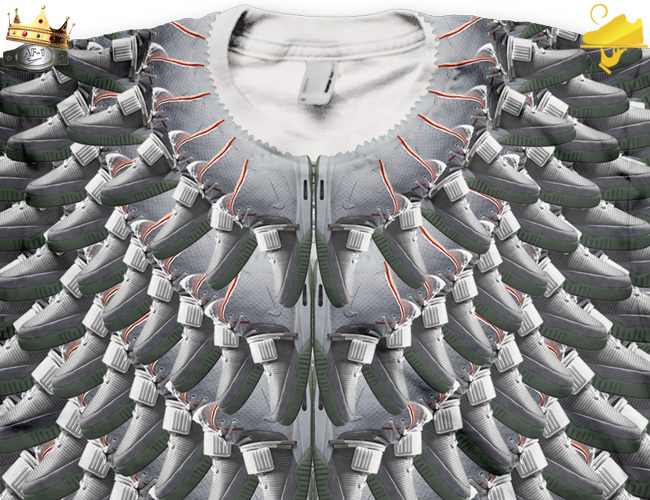 With my growing line of custom sneakers and flourishing line of custom and limited shirts, it was only natural that I push the envelope to extend some of my sneaker designs and smaller scale shirt designs to larger formats. 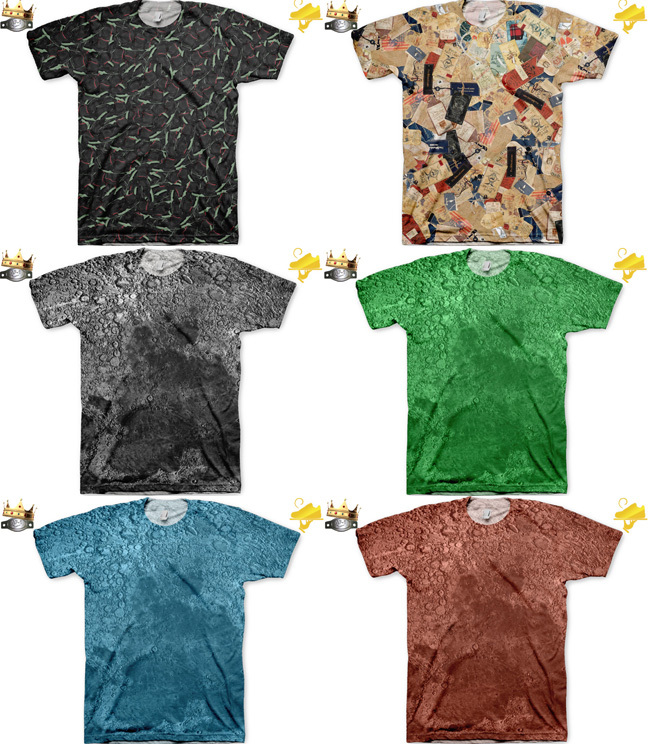 “The Feast” line of shirts feature an all over print, front and back, and use a spun polyester shirt by American Apparel. This is a premium shirt that carries a premium price. Each shirt is made to order the graphics are astonishing. Among this first run is an amazing Polo-ist shirt that showcases my love for RL and displays my collection of rare RL tags. Also among this first launch is a black version of the “$90,000” shirt released by another designer a short time ago. The shirt is obviously directly influenced by the grey version, yet features the black and solar red Air Yeezy 2. The printing method and shirt are exactly the same as the $90,000 shirt. Lastly is my “Moonpie” shirt, a clear hookup to my Custom Foampollo One. You purchase after the jump and see larger images. As a follow up the my previously released “Foampollo One” this customized Royal Blue Foamposite One utilizes an almost over-used galaxy theme. With the upcoming release of the Galaxy Zoom Rookie I don’t see the galaxy theme going anywhere anytime soon, so why not “kick it up a notch” in true Chef fashion? 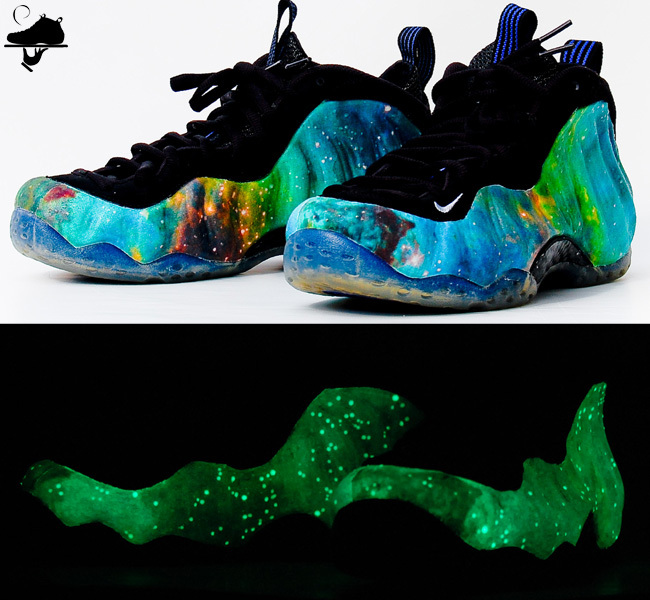 So what more can be done to a galaxy foamposite that has not been done before? Well make the whole thing glow of course! The entire upper of this custom masterpiece glows, as opposed to the soles which many artists have illuminated in various ways. The glow in the dark treatment adds great depth to the galaxy print, shining brighter in areas where corresponding brighter colors appear on the print, and showing up cloudier where darker hues prevail. The stars are accented to glow the brightest making the night view of this shoe mimic a stellar scenery indeed. You can purchase a pair after the jump and earn yourself a 1 on 1 consultation with Chef to discuss exactly what galaxy or nebula print you wish to use. With a huge repository of galaxy and nebula images at his disposal Chef is sure to keep each and every order a 1 of 1.